In other words, no human being should be death's guinea pig. We were all reminded of this Tuesday night when the state of Oklahoma executed Clayton Lockett in a gruesome experiment. Using an untested protocol, with secretly obtained drugs, the state started Lockett's execution at 6:23 p.m. Ten minutes later, Locket was pronounced unconscious and administered the second and third drugs. Shortly thereafter, it became clear that Lockett was not unconscious as he writhed, breathed heavily, and mumbled. He clenched his teeth and tried to rise off the bed. His lawyer said it looked "like torture." The prison officials then dropped the blinds, blocking the view. The warden called off the execution, announcing the obvious: The doctor had observed a problem. He said Lockett's "vein had blown," and they did not know how much of the drugs he had received. Lockett died shortly thereafter of a heart attack when his heart literally burst in his chest. As the White House acknowledges, Lockett's execution fell short of the humane standards required when the death penalty is carried out. This was not the first failed experiment in new lethal injection protocols – and not even in Oklahoma. The main drug used in earlier years of lethal injection, sodium thiopental, is no longer available because its manufacturers object to the use of medication for killing. This has led states to concoct new execution protocols and to scramble for alternative drugs. The new protocols are no more scientific. Recent executions have relied on pentobarbital or midazolam. Both have terrible track records. The reports from observers of Lockett's execution, which used midazolam, have a strong resemblance to those from Dennis McGuire, whose botched execution in Ohio took place a few months earlier in January. After McGuire was reported by the prison as unconscious, he clenched his fist, heaved, struggled, and made horrible noises, according to witnesses. He was gasping, choking, and snoring in the 25 minutes it took to kill him. The Ohio death recipe is the same that Louisiana wants to follow. We know that pentobarbital, the other drug used in recent executions, will cause excruciating pain in poorly regulated or contaminated batches. Before its new protocol, Oklahoma relied on pentobarbital. This was what was used to execute death row inmate Michael Lee Wilson, who cried out during his execution, "I feel my whole body burning." These botched executions raise critical questions: Why did the execution go so wrong? Is there any reason to think that these particular protocols and combinations of drugs would ever work? Where did the drugs come from, and were the drugs themselves contaminated? Lockett's lawyers had tried to get answers about the source and the quality of the drugs to be used well before his execution, and a lower court initially ruled that Oklahoma would have to provide these details. But after a wild and unbelievable litigation path – which involved a lawmaker threatening to impeach the state supreme court and the governor asserting that she was not required to follow the supreme court's ruling – the Oklahoma Supreme Court ruled that the execution could proceed in a cloud of secrecy. Where the drugs come from is a critical question. Many of the drugs – including pentobarbital – are not available through traditional manufacturers and can only be obtained throughcompounding pharmacies, where reliability and safety are major concerns. Eric Robert was executed in 2012 by South Dakota using compounded pentobarbital. After he was injected, he gasped heavily, snored loudly with his eyes open, and his skin turned purple. An expert pharmacologist has described this reaction as consistent with contaminated drugs. States have tried to fend off these critical inquires about the sources of their drugs by relying on secrecy statutes or litigation. The Supreme Court has yet to wade into this area, but a federal appeals court allowed a Missouri execution to go forward under a total veil of secrecy about where the drugs came from. As a dissenting justice described, the "pharmacy on which Missouri relies could be nothing more than a high school class." Last month, the UN Human Rights Committee, which monitors compliance with the International Covenant on Civil and Political Rights – a treaty ratified by the United States in 1992, expressed concerns regarding the use of untested drugs in lethal injections. The committee noted "with concern reports about the administration, by some states, of untested lethal drugs to execute prisoners and the withholding of information about such drugs." 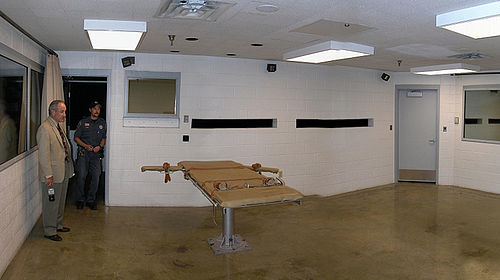 The committee recommended that the U.S. government "ensure that lethal drugs used for executions originate from legal, regulated sources, and are approved by the United States Food and Drug Administration and that information on the origin and composition of such drugs is made available to individuals scheduled for execution." These recommendations – transparency and oversight by the F.D.A. of all drugs used in lethal injections – are important ones, but we need full answers about what has gone so horribly wrong. Governor Mary Fallin has acknowledged the need for investigation, but so far, she has failed to appoint an independent investigation. Oklahoma has given us no reason to have confidence that an executive investigation will provide any serious inquiry. Before Oklahoma, or any other state, engages in executions, we need real answers from an independent investigation. Only with that information can states formulate the effective and transparent standards that the Constitution requires.